Setting: Brother T (who was at Gracepoint Berkeley Church when this happened, but he's now at Gracepoint San Diego) was playing sports and dislocated his index finger. He was rushed to the hospital where a triage nurse saw him. Nurse: Okay, your finger is dislocated.. so I'm going to try to pull your finger back into place. Nurse: (immediately stops pulling the finger... pauses) Okay.. Let's try that again. 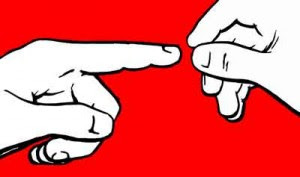 The above story demonstrates that sometimes "pull my finger" is no joke.